He showed up for his last outing of the year against Baltimore, this port-siding blonde demon, with a boozy head and nothing on his pitches. New Yorkers were actually worried. Then Whitey Ford handled the Braves rather easily in the opener, a mere warmup act for his 7-0 command performance in Game Four today. Milwaukee never had a chance, and this World Series is one Yankee win from a too-early closing curtain. Actually, the Chairman of the Board and Carl Willey both looked wonderful for the first three innings, but Willey was the resident mortal. He walked Carey, gave up a Slaughter single and run-scoring grounder to Mantle in the 4th. A Siebern single, Carey walk and Berra RBI single in the 6th made it 2-0. One run would have been enough, because Whitey’s stuff was demonically good. The Yankees even tried to make it a rough day for him, and he wouldn’t have it. Skowron booted a grounder hit by Mathews in the 1st, but after a Roach single, Aaron grounded into his third twin killing of the Series. In the 4th, Hank started the inning by reaching first on catcher’s interference, and guess what? Adcock grounded into a double play. Felix Mantilla hit a pinch single to start the 8th, but oh yeah—Roach grounded into an inning-ending double play. Meanwhile, the Bombers were lobbing soft grenades all over the field and exploding them. A Mantle walk and Berra bloop double began their 8th. Willey gave up a sac fly to McDougald to make it 3-0, and when Trowbridge came in to face lefty Kubek, said lefty Kubek lined a home run to right that just made it over Pakfo’s leaping glove. For the sheer fun of it, they scored twice more in the 9th with a Carey double and obligatory Johnny Logan error in the mix, and County Stadium was so quiet you could hear obnoxious tavern cheering all the way from the Bronx. Unless you were a Yankee fan, there was nothing good about this game. 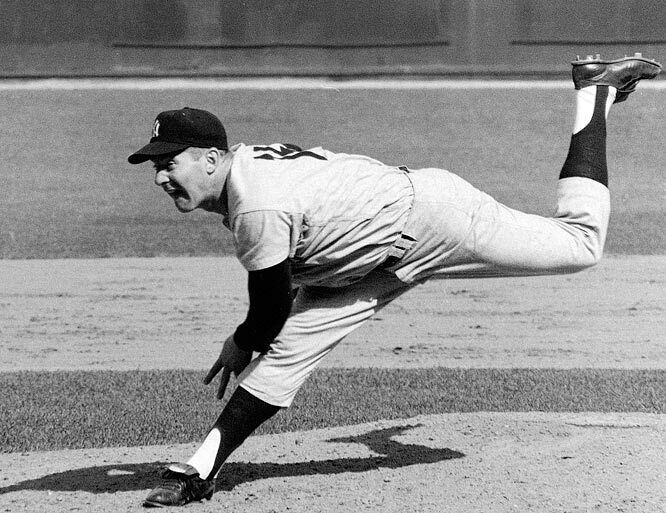 It will now be up to Warren Spahn to save the day in Game Five, a man who couldn’t get out of his own ghastly way in New York. He’ll face Bob Turley, prone to be wild, with the hope that another midwest miracle is in the cards. And the dice. Don’t forget, the Game Five account will appear in Sunday’s Special Mystery Ball edition! Sorry, no video today. Whitey wiped that away, too. Hmm. Not looking good for Bushville. Well, the whole Seals Stadium, San Francisco, Candlestick Point thing wouldn’t quite work for Mystery ball ’57. 😉 If Spahn can win tomorrow, then ya never know.